You could say that Andrew Allen of The Antipodean Blog is a bit of a Broadway fan - on his last visit to New York he squeezed in eleven shows in just seven days, and yet he didn't blow his budget in the process. These are The Antipodean’s top tips for Broadway on a budget, whether it’s your first show or your hundredth. New York City is the centre of the theatre universe. Whether or not you see yourself as a fan of live theatre, it’s a quintessential part of the New York experience. This is the place where pioneering artists first had the idea to merge popular sketches with opera, inventing the modern musical in the process. 80 years later, there is still nothing quite like that rush of exhilaration you get when you’re sitting in a beautiful old dusty theatre and the lights begin to dim. Everyone around you leans slightly forward with anticipation, as the curtain begins to rise. I strongly urge everyone visiting New York to see at least one show. Some websites or ticket salespeople will give a great review to every show in order to sell more tickets. Instead of relying only on reviews, I’d suggest firstly see something you can’t see at home. Secondly, consider picking something that has won the Best Musical Tony Award (which is the theatre equivalent of an Oscar). This is always a good sign! In London there are cheap ticket booths all over the city, but in New York there’s only one licensed reseller of theatre tickets: TKTS. The main booth is located under the large steps in the heart of Times Square. It sells day-of tickets only, at 3pm for evening shows and 10am for matinees. Queues build up here but tend to move quickly. Several volunteers walking the queue will be happy to give you advice on what to see if you haven’t made up your mind yet. If you have an iPhone you can also now book tickets using the TKTS app, from the same time they go on sale at the booth. Cheaper isn’t always a good thing. Theatres in New York are often cavernous, and a $15 seat isn’t such a great deal if you can’t see half the stage. Particularly if you’re only seeing one show, it’s worth paying a little more for a better view of the stage. You enjoy a night at the theatre, and might even see more than one while you’re in town. If you’re seeing more than one show, go for some variety. This can mean choosing one musical and one play, or something you’ve seen before and something you haven’t. But more than anything else, I’d recommend visiting one of the downtown venues for an Off-Broadway show. Not only will you get to see one of the hippest parts of New York – the Lower East Side – but you’ll also be able to see something that’s not ‘safe’ enough for Broadway. With the global recession, often original shows are seen as risky investments because they don’t have the pre-existing fan-base of a revival or a movie-based show. So, the most wonderful theatre in New York often takes place downtown, where the show can go on without needing an eight figure investment. Plus, tickets are cheaper and venues are more intimate – what’s not to love? TKTS is great for buying on the day, but if you already know what you want to see before you leave home, the best place to buy advance tickets is usually BroadwayBox.com. They offer discount advance tickets for most shows. Even if the same show ends up a bit cheaper at TKTS on the day, keep in mind that you will have secured much better seats by booking earlier – so it was probably still worth it. Theatres are always more full on the weekend, so if you want better seats for your money, consider choosing a matinee or a week night. Broadway and New York are synonymous for you, and the list of shows you’d like to see is impossibly long. Playbill.com publishes a page every week here showing attendance for every show on Broadway. This is really useful when you’re trying to decide whether to book ahead or not. The most popular shows (especially 2011 Tony winner ‘The Book of Mormon’) will sell out months in advance, so you’ll want to book those before you arrive. Anything below 70% attendance on the Playbill chart is likely to have plenty of discounted day-tickets, but I’d recommend booking in advance to be safe if it’s higher than that. If you’re trying to see as many shows as possible, don’t rely on memory. Make a little calendar, and start by checking performance schedules. In New York, not many shows perform on a Monday. So if there’s something you want to see that does perform on a Monday, book that in first – it saves you from wasting a night. Make notes to help you keep track of which shows you’ve already booked, and which ones you’ve decided to queue for on the day. If you’re seeing a show every day, there are some practical things you can do to make sure you still have enough time to experience the rest of this wonderful city when you’re not at the theatre. Firstly, book a hotel near 42nd Street because most of the theatres are nearby and it will save you from spending all your time in transit. Secondly, matinees are always on Wednesday, Saturday and Sunday. If you’re booking any full-day trips or tours, you’ll want to avoid those days. Lastly, have a meal at Sardi’s – this Broadway restaurant is frequented by Broadway royalty and has brilliant caricatures of literally all of them plastered over its walls. No matter which show (or shows) you end up seeing, you won’t regret it, I promise! 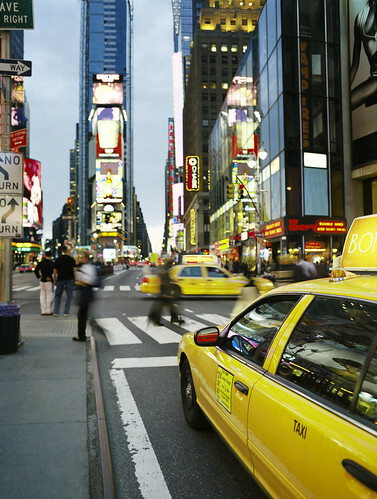 For a great deal on a New York holiday visit our website.